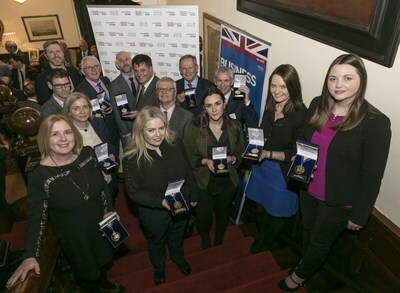 Eleven National Winners from the Republic of Ireland were named at an exclusive event held at the British Ambassador's residence in Dublin last night for The European Business Awards, Europe's largest business competition, sponsored by RSM. The celebrated companies were chosen by a panel of independent judges including senior business leaders, politicians and academics as the best in the Awards' 11 categories, and they will now go on to represent their country in the final stage of the competition. At the event, business leaders came together to celebrate and network with their peers after being successfully named as 'Ones to Watch' in a list of business excellence published in December, all hoping to be named National Winners. British Ambassador, Robin Barnett CMG said, “I was delighted to host this event to celebrate the success of the 11 organisations selected to represent Ireland as National Winners in the European Business Awards. Their determination to succeed is a role model to others. We already see them as winners. The British Embassy in Ireland and the UK Department for International Trade look forward to supporting these companies with their UK growth plans as they continue to expand.&nbsp;The UK is a great place to do business with one of the world's most open and pro-business environments and offers businesses like these access to innovation, R &amp; D, finance and a talented workforce. I have no doubt that these companies will continue to grow and prosper. The European Business Awards is now in its 11th&nbsp;year and its primary purpose is to support the development of a stronger and more successful business community throughout Europe. Last year it engaged with over 33,000 businesses from 34 countries. Sponsors and partners include RSM, ELITE, Germany Trade &amp; Invest and PR Newswire. Germany Trade &amp; Invest is the economic development agency of the Federal Republic of Germany. The company helps create and secure extra employment opportunities, strengthening Germany as a business location. With more than 50 offices in Germany and abroad and its network of partners throughout the world, Germany Trade &amp; Invest supports German companies setting up in foreign markets, promotes Germany as a business location and assists foreign companies setting up in Germany.